Home Cleansing Foraging for food – a wild experience! Foraging for food – a wild experience! 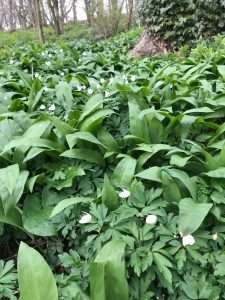 My experience was in the spring, so I got to know about wild garlic and have never looked back. Wild garlic is a wonderful verdant plant that grows in woodlands and tastes like – garlic! No surprise there. However it has many benefits that bulb garlic doesn’t. The bulb is there if you dig down, but there are codes of conduct when picking wild anything! Don’t dig up the bulb is a short summary! Best of all – it clears out all the bugs and buglets – the ones you don’t need too many of! First, the big rule of foraging is DO NOT PULL UP THE BULB! In other words, leave it for the next year, and the next and the next. This applies across all foraging. Pick it before the flowers start to grow. Be careful to make sure you are not picking in an area frequented by dogs, so off the beaten track. Move from plant to plant taking a little from each. Respect the Countryside code and especially only forage for yourself and your family. Commercial foraging is illegal under the Countryside Act. Stick to the four Fs – fruit, foliage, flora and fungus (personally I wouldn’t touch fungus, very tricky if you get it wrong). Imposters! Do not eat anything unless you are certain it is safe. There are plants that look like wild garlic but are not. Worse, they are TOXIC. My advice, just book on one of Rosie and Chris’s course and have a wild experience! They still have days available. Here’s a poisonous plant that can (and has been ) mistaken for wild garlic. See the little indents at the stem. It’s sort of heart shaped whereas wild garlic is grass shaped. Lords and Ladies – or Cuckoo-pint. Severe irritation to throat and mouth if eaten. Don’t accidentally pick Lily of the Valley. 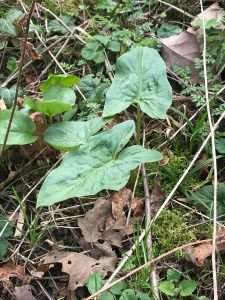 This has several leaves per plant stem (wild garlic is just one leaf). Plus it is HIGHLY POISONOUS! You have been warned…. big disclaimer here. Be careful and go with Chris and Rose to begin your journey. The Seaside – you must go down to the sea today..